The fabulous Garden Route is a highlight of any trip to South Africa and if you would like somebody else to take care of the driving while you concentrate on enjoying the scenery, this small group tour operated by Ilios Travel is ideal! Travel in an air-conditioned mini bus with an experienced driver guide and stay in comfortable accommodation. The tour gives you the opportunity to view the magnificent Cape Winelands, lush Route 62 and the Knysna region. Leave Cape Town and travel along the N1, through the Huguenot Tunnel and on to Route 62. Cape Route 62 is the tourist route in the Western Cape, offering the shorter, scenic alternative to the N2 highway. 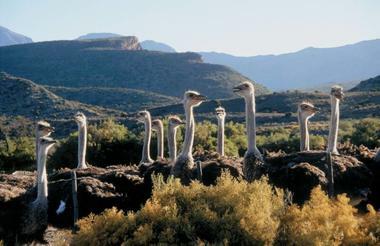 Enjoy a lunch stop (not included in cost) in Barrydale then continue on to Oudtshoorn where your first stop will be at an Ostrich Farm, where you can enjoy an informative tour (included in cost). Enjoy a morning tour of the Cango Caves – one of the natural wonders of the world. 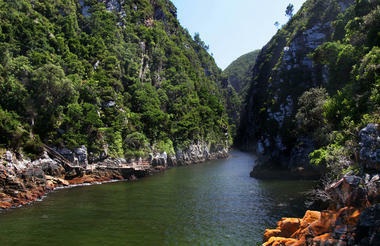 Travel to the lagoon-side town of Knysna – gem of the Garden Route before continuing your journey to Plettenberg Bay. Embark on an informative cruise up the Keurbooms River before check-in to your accommodation where you shall spend the following two nights. Freshen up before dinner at the lodge. Early morning takes you to the beautiful Tsitsikamma National Park. Tsitsikamma originates from the Khoi-Khoi language used by the local Inqwa Tribe that lived in the area some 1700 years ago meaning "a place of many / sparkling / abundant water". 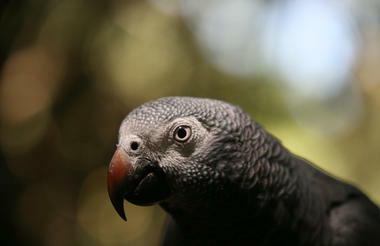 Enjoy lunch (not included in cost) in the Tsitsikamma National Park. The tour terminates in Port Elizabeth.